During the warm days of summer, island fox pups grow up fast. Through rough and tumble play with their siblings, they learn to stalk and pounce. Small paws pin a sister or brother to the ground. They practice grabbing hold with their sharp little teeth and shaking. All of these behaviors are important skills for hunting. 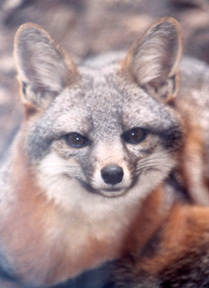 Stalking and pouncing are the actions used by island foxes to catch island deer mice, birds, lizards and snakes, and even some insects, like grasshoppers. Island fox catches a snake. Both parents help to teach the island fox pups where and how to find the variety of food they will need to survive on the rugged Channel Islands. As summer continues, fruit will ripen on a variety of native plants, bringing new food opportunities to the growing island foxes. 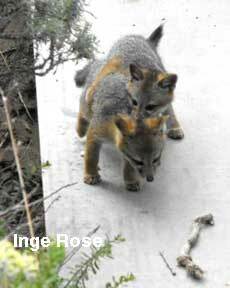 Link to a video of island fox pups on Catalina Island sent to FIF by an island fox friend. Watch for the three pups, just like in Tani's family.